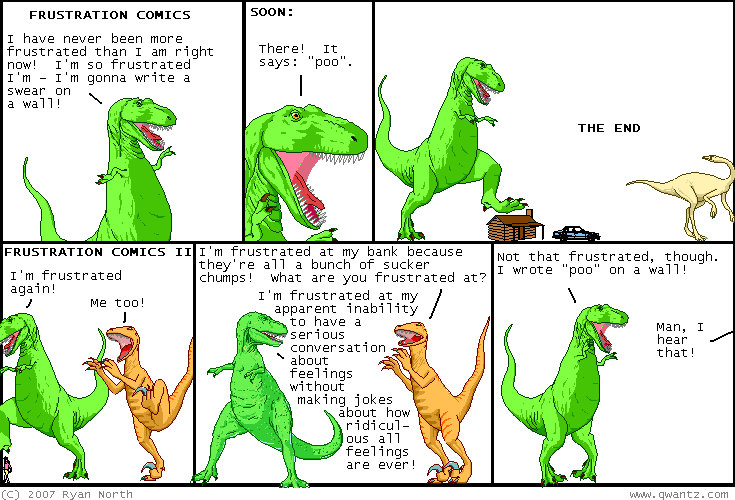 Dinosaur Comics - November 26th, 2007 - awesome fun times! November 26th, 2007: If you're planning to order a Dinosaur Comics shirt or hoodie for Christmas, AND you're not shipping to the USA, this week is the last week you can order and get them in time for Christmas. So if that is your plan, if that is where you see yourself, then you should totally order this week! I was really busy last week and neglected to mention that MC Frontalot is on tour! But the tour has ended now and I feel like a jerk. BUT if you check out his site you can buy his CD which I recommend and also download tracks that are at once sweet AND fresh. Speaking of rappers, I found out just last night that Abdominal is a Toronto boy! You've probably seen the great video for 3 Feet Deep (if not, check it out: it features a computational linguist's dream machine) but you've got to love a guy who will rap about standing on the correct side of the escalator (that song's here, click on "Walk Left Stand Right"). One year ago today: originally in panel 3 t-rex said 'i am seriously trying to evolve my head off over here', but that was a pretty disgusting mental image.